Thank you all for listening! 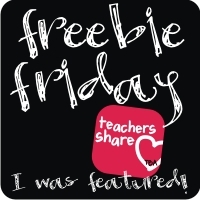 For being such wonderful listeners, I am linking up with Freebie Friday to share with you some things I'm using in my classroom! We have been working on Figuartive Language in my classroom, and focusing on Metaphors and Similes this week. I wanted my students to be able to really understand how to write similes so I created this freebie for them to write similes all about themselves, someone else, and then do a fun homework with similes. Here are examples of some from my room and you can pick up your free copy here. My teaching partner and I were trying to think of a fun game to play with the kiddos next week during our Holiday party that wouldn't be too messy, but still fun for our fourthies. So I created this fun Holiday Charades. Simply print, cut into strips, and place in a hat or bowl for students to pick from! We can't wait to play :) Click here to download your copy for free! I hope everyone enjoys these freebies! Ha! You had me at Amelia Bedilia! Thanks for this freebie! I'm your newest follower (and I'm having a fun linky- swing by and link up)!